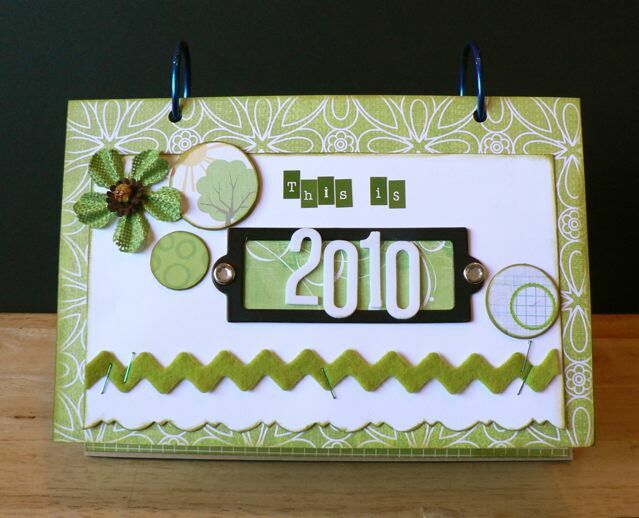 I’ve always been slightly annoyed with scrapbooking calendars. While I can see the sense of looking up from your calendar to the child in front of you and noting the change from the previous year, I am quite sure when I am old and senile (it’s happened already, apparently, according to DS) I will look back at the 2009 calendar and think “He looks younger than 16” and be very, very confused LOL! So, back to my WOYWW – I was working on a desk calendar. I constructed the frame (might have to do one of my little YouTube slideshows on that) and then built the pages on those kraft divider cards that I love. I found a nice calendar online, downloaded the PDF and then (as it was an every-month-on-one-page wall calendar) marked and copied the individual month, resized them, then printed them on cardstock. Using the celery green as my colour scheme (more or less) I made January to June, then working backwards on the back of the pages, made July to December – that way I can flip to June then reverse the whole thing and flip them back. It keeps the bulk down. 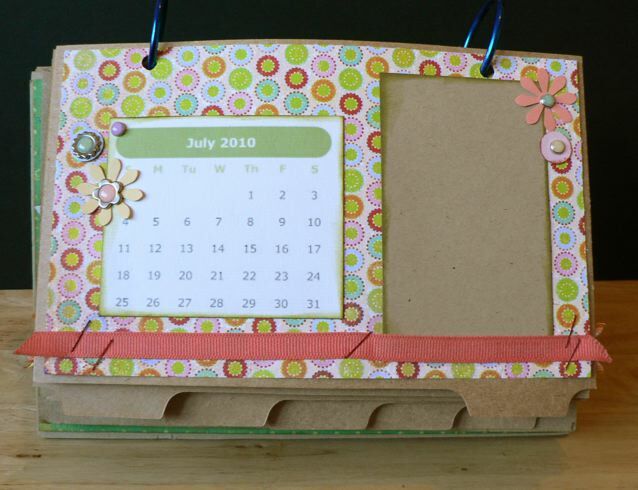 Each page is basically the same layout – month and 2.5 x 4 inch chunk of kraft cardstock. A simple embellishment on each page, with a bit of stapled ribbon, and everything inked if appropriate. The plan is to TAKE a photo every month and add it to the calendar so at the end of the year I have a photographic record. The base and rings I can use again – although it annoys me to have BLUE book rings (I need to get some green ones or silver the right size) I wanted to share it so try not to think about the “blue and green should never be seen” malarky! While I would never, ever commit to one of the Take-a-photo-a-day challenges, I would like to think even I can manage one a month! There are still a few bits and bobs to sort (like the month on the tab, and covering the back of the cover) but they will happen as soon as I get caught up on a few more things. 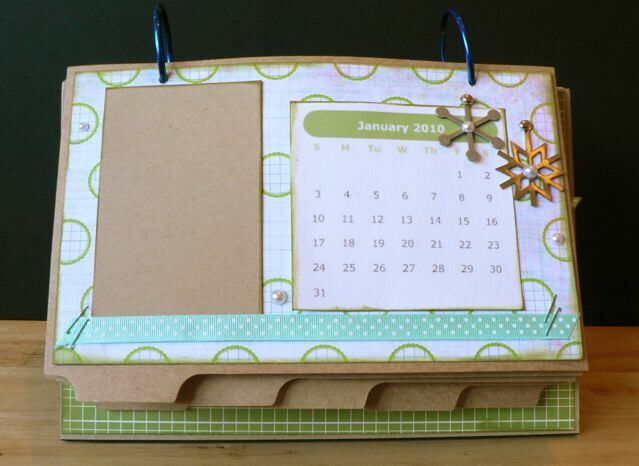 Categories: scrap related, WOYWW | Tags: calendars | Permalink.